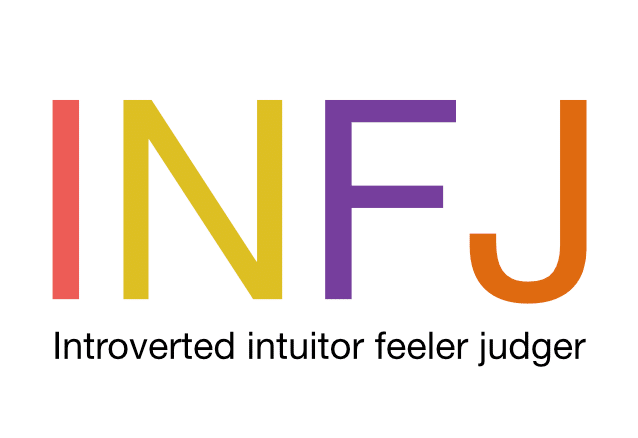 The Judger element of the INFJ Myers Briggs personality type means that Feeling is extraverted with this personality type and Intuition is introverted. Their preference in how they decide and come to conclusions (Judgement) is through Feeling rather than Thinking. 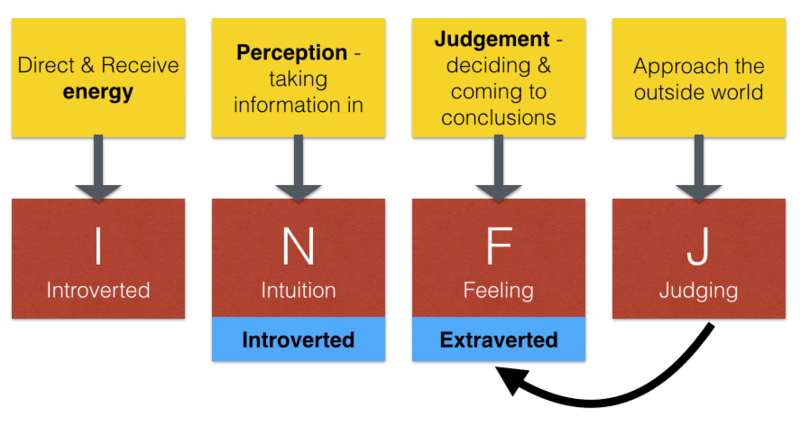 Their personality dynamic is therefore Introverted Intuition with Extraverted Feeling. Their third preference is Thinking and their inferior function is Extraverted Sensing. allow for their creativity and conceptual ideas. I am mainly introvert, but sometimes extrovert and on occasion very extrovert. I tend to be quiet in groups but if I find something I’m really interested and enthusiastic about, I can talk and talk for hours. I’d say that I’m more of an intuitor, I’m future oriented, like to see how all of this fits together, relationship of ideas, but then I also like facts and data, and results, task completion so I’m somewhere along the line on that one too. Definitely more of a judger, I like schedule, organisation, closure, do not like changes to schedule, although I am adapting to this currently, schedule changes are frequent in my job and I’m not as bothered anymore. I do love to explore though and can easily be distracted when I’m at rest. I am an introvert, because I like to be alone whilst loading my batteries. I do one thing at a time, I am not a hotel-lover and I am not a hugger. I am an intuitor, because I like to know how something new fits in the things I already know. I immediately forget your facts… And you should see my collection of puzzles! I think I am a feeler, just based upon the answer to the question ‘would you like to thought of as a fair, caring sensitive person’. But I could never, ever say something like ‘you don’ t have a heart’! I am a judger, because I like my schemes and I don’t like you to come up with ‘today we’ re going to do something different ‘. But I can easily switch to perceiver. My sister is an introvert as needs her me-time and enjoys calmness and relaxation, but on the other hand she is the first one to organise a party or a day out. She gets immense energy from her kids and enjoys being in a lively office environment. She works in marketing where she can put her personality and communication skills to very good use. She loves to talk and speaks 3 languages. She is an intuitor, also high kinesthetic as me. She possesses exceptional social skills and trusts her intuition blindly. When telling a story she always paints the bigger picture and tries to get to the reason behind the reason. She actually likes puzzles and playing tricky board games that take hours. When necessary she can easily switch to sensor mode and is very knowledgeable about details if she needs to but clearly doesn’t enjoy them very much. She is a big feeler but also with a small share of thinker. She has a very big heart and avoids conflict and change. She is extremely dedicated and committed to her loved ones and often way beyond. Her main concern is personal wellbeing, happiness and health. She shows endless patience with people and clearly wants to be loved. She never forgets birthdays and anniversaries and is very generous and good in gift making. She is a judger and does organise her life and the lifes of her family. There are huge lists hanging on her fridge with a column for each member of the family! She hates when being late and excuses herself many times. But there must be a perceiver in her as well as there are times when she just lets loose (within her boundaries) and the adventurous side in her comes out. She can be very creative and loves handicrafts work and decorating. I know that she enjoys these moment immensely and seeks out these little “break-outs” to feel free. When making mistakes she takes that extremely to heart. I have struggled with an introvert/extrovert controversy in my life. I used to live as a total extrovert before but have now lived as an introvert for the past four years. I was previously taught that we were created a certain way and that it is important to find that original design so that we can be healed of hurts and restored to that make-up. I love the NLP approach which states that we can change over time and also operate differently in varying situations. When it comes down to the one question of recharging, I am definitely an introvert. I like to be alone and kind of organize my inner world after a busy time outside with other people. Other than that, I am a very extroverted introvert. I usually speak before I think, tell everyone everything, process things verbally and like to hug people. I get easily excited and enjoy the energy of a big group. I am definitely an Intuitor. I like abstract thinking and get bored with details. I need to see how ideas fit together and I am constantly looking for ways to improve things, situations and people. I like puzzles and prefer to live in the future. I have built many possible future lives for us already in more than few countries and have great difficulty in focusing on the details of the life here and now. There is also nothing unclear about me being a Feeler. I see myself as a caring and loving person and naturally extend myself for others. I am kind and gentle-hearted to a point where it is actually a bit of a handicap. I often think that I need to learn to protect myself a little bit and also to dissociate from my feelings at times in order to not be easily hurt and to be able to make good decisions. Judger/Perceiver has been another conflict within me, but just answering that one specific question makes me a Judger. I like my work to be organized and planned, I do need closure and I write lots of lists in order to remember things. On the other hand, I live to explore new territories and like to keep my options open. I do not like routine and needs lots of variety and change. I work best with projects, because they don’t require a long term commitment from me. So, I am functioning as an INFJ at this point in my life.